This article is about the German international broadcaster. For the unrelated German radio company of the 1920s and 30s, see Deutsche Welle GmbH. For the musical genre, see Neue Deutsche Welle. Deutsche Welle (German pronunciation: [ˈdɔʏtʃə ˈvɛlə]; "German wave" in German) or DW is Germany's public international broadcaster. The service is available in 30 languages. DW's satellite television service consists of channels in English, German, Spanish, and Arabic. While funded by the German government, the work of DW is regulated by the Deutsche Welle Act, meaning that content is always independent of government influence. DW is a member of the European Broadcasting Union (EBU). DW offers regularly updated articles on its news website and runs its own center for international media development, DW Akademie. The broadcaster's stated goals are to convey Germany as a "liberal, democratic state based on the rule of law", to produce reliable news coverage and to provide access to the German language. DW has been broadcasting since 1953. It is headquartered in Bonn, where its radio programmes are produced. Television broadcasts are produced almost entirely in Berlin. Both locations create content for DW's news website. As of 2018, around 1,500 employees and 1,500 freelancers from 60 countries work for Deutsche Welle in its offices in Bonn and Berlin. According to DW, its output reaches 157 million people worldwide every week. The Director-General of DW is Peter Limbourg. DW's first shortwave broadcast took place on 3 May 1953 with an address by the then West German President, Theodor Heuss. On 11 June 1953, ARD public broadcasters signed an agreement to share responsibility for Deutsche Welle. At first, it was controlled by Nordwestdeutscher Rundfunk (NWDR). In 1955, NWDR split into Norddeutscher Rundfunk (NDR) and Westdeutscher Rundfunk (WDR), WDR assumed responsibility for Deutsche Welle programming. In 1960, Deutsche Welle became an independent public body after a court ruled that while broadcasting to Germany was a state matter, broadcasting from Germany was part of the federal government's foreign-affairs function. On 7 June 1962 DW joined ARD as a national broadcasting station. Deutsche Welle was originally headquartered in the West German city of Cologne. After reunification, when much of the government relocated to Berlin, the station's headquarters moved to Bonn. With German reunification in 1990, Radio Berlin International (RBI), East Germany's international broadcaster ceased to exist. Some of the RBI staff joined Deutsche Welle and DW inherited some broadcasting facilities, including transmitting facilities at Nauen, as well as RBI's frequencies. DW (TV) began as RIAS-TV, a television station launched by the West Berlin broadcaster RIAS (Radio in the American Sector / Rundfunk im Amerikanischen Sektor) in August 1988. The fall of the Berlin Wall the following year and German reunification in 1990 meant that RIAS-TV was to be closed down. On 1 April 1992, Deutsche Welle inherited the RIAS-TV broadcast facilities, using them to start a German and English-language television channel broadcast via satellite, DW (TV), adding a short Spanish broadcast segment the following year. In 1995, it began 24-hour operation (12 hours German, 10 hours English, 2 hours Spanish). At that time, DW (TV) introduced a new news studio and a new logo. Deutsche Welle took over some of the former independent radio broadcasting service Deutschlandfunk's foreign-language programming in 1993, when Deutschlandfunk was absorbed into the new Deutschlandradio. In addition to radio and television programming, DW sponsored some published material. For example, the South-Asia Department published German Heritage: A Series Written for the South Asia Programme in 1967 and in 1984 published African Writers on the Air. Both publications were transcripts of DW programming. In September 1994, Deutsche Welle was the first public broadcaster in Germany with an internet presence, initially www-dw.gmd.de, hosted by the GMD Information Technology Research Center. For its first two years, the site listed little more than contact addresses, although DW's News Journal was broadcast in RealAudio from Real's server beginning in 1995, and Süddeutsche Zeitung's initial web presence, which included news articles from the newspaper, shared the site. In 1996, it evolved into a news website using the URL dwelle.de; in 2001, the URL changed to www.dw-world.de, and was changed again in 2012, to www.dw.de. Deutsche Welle purchased the domain dw.com, which previously belonged to DiamondWare, in 2013; DW had attempted to claim ownership of the address in 2000, without success. DW eventually moved to the www.dw.com domain on 22 June 2015. DW's news site is in seven core languages (Arabic, Chinese, English, German, Spanish, Portuguese for Brazil, and Russian), as well as a mixture of news and information in 23 other languages in which Deutsche Welle broadcasts. Persian became the site's eighth focus language in 2007. German and European news is DW's central focus, but the site also offers background information about Germany and German language courses. Deutsch, Warum Nicht? (literally: German, Why Not?) is a personal course for learning the German language, created by Deutsche Welle and the Goethe-Institut. In 2001, Deutsche Welle (in conjunction with ARD and ZDF) founded the German TV subscription TV channel for North American viewers. The project was shut down after four years owing to low subscriber numbers. It has since been replaced by the DW-TV channel (also a subscription service). Unlike most other international broadcasters, DW-TV does not charge terrestrial stations for use of its programming, and as a result, Journal and other programmes are rebroadcast on numerous public broadcasting stations in several countries, including the United States, Australia, and New Zealand. In the Philippines, selected Anglophone programmes are shown nationwide on Net 25. In 2003, the German government passed a new "Deutsche Welle Act", which defined DW as a tri-media organization, making the Deutsche Welle website an equal partner with DW-TV and DW Radio. The website is available in 30 languages, but focuses on German, English, Spanish, Russian, Brazilian Portuguese, Chinese, and Arabic. Persian became the eighth focus language in 2007. In March 2009, DW-TV expanded its television services in Asia with two new channels, namely DW-TV Asia and DW-TV Asia+. DW-TV Asia (DW-TV Asien in German) contains 16 hours of German programming and 8 hours in English, whilst DW-TV Asia+ contains 18 hours of English programmes plus 6 hours of German programmes. In August 2009, DW-TV's carriage in the United Kingdom on Sky channel 794 ceased, although the channel continues to be available via other European satellites receivable in the UK. In 2011, DW announced a major reduction of service including the closure of most of its FM services in the Balkans (except for Romani), but that it would expand its network of FM partners in Africa. The radio production for Hausa, Kiswahili, French, and Portuguese for Africa were optimized for FM broadcasts and DW also produces a regional radio magazine daily in English, to be rebroadcast by partners in Africa. Audio content in Arabic is distributed online, via mobile, or rebroadcast by partners. DW announced it would focus on FM partnerships for Bengali, Urdu, Dari/Pashtu, and Indonesian for South Asia, India, Pakistan, and Afghanistan. On 1 November 2011, DW discontinued shortwave broadcasts in German, Russian, Persian, and Indonesian and ended its English service outside Africa. Chinese programming was reduced from 120 minutes to 60 minutes a week. As of November 2011, DW only broadcast radio programming via shortwave in: Amharic, Chinese, Dari, English and French for Africa, Hausa, Kiswahili, Pashtu, Portuguese for Africa and Urdu. The budget of the Deutsche Welle for 2016 was 301.8 million euros. On 25 February 2018, DW-TV published "The Climate Cover Up - Big Oil's Campaign of Deception" (2018) after documents confirmed big oil companies have known the burning of fossil fuels impacts climate since 1957. On 22 June 2015, DW TV launched a 24-hour English-language news channel with a new design and a new studio as part of a rebrand to DW News. Previously, DW's news programmes were called Journal and broadcast in English in 3, 15 and 30-minute blocks. The new channel offers 30-minute updates every hour and 60-minute programmes twice a day on weekdays. DW News broadcasts from Berlin but frequently has live social media segments hosted from a specially-designed studio in Bonn. The German, Spanish and Arabic channels also received a new design. At the same time, DW's news website moved from a .de URL to .com and added a social media stream to its front page. The refreshed DW services were launched under the tagline 'Made for Minds'. On 10 April 2019, DW announced that Venezuela’s state telecoms regulator Conatel had halted its Spanish-language channel. By 15 April 2019, the broadcasting service was restored. The Jülich radio transmitter site began operation in 1956 with eleven 100 kW Telefunken transmitters. The Wertachtal site was authorized in 1972 and began service with four 500 kW transmitters. By 1989 there were 15 transmitters, four of which relayed the Voice of America. The Nauen transmitter site was inherited from Radio Berlin International. RBI's Russian-made three 500 kW and one 100 kW transmitters were replaced by four Telefunken 500 kW transmitters and four rotatable antennas. Deutsche Welle no longer uses any of transmitters in Germany. Kigali, Rwanda: A relay station in Kigali, Rwanda, was inaugurated on 30 August 1963, and provided coverage for Africa. This relay station closed 28 March 2015. Sines, Portugal closed on 30 October 2011 and was due to be dismantled after a few months. DW used a relay station in Malta had three SW and one 600 kW-MW transmitter and gave partial coverage of the Americas, Southern Asia and the Far East. It was inaugurated on 29 July 1974 in exchange for a grant of almost 1 million GBP. The station closed in January 1996. Formerly, DW shared a transmitting station on Antigua in the Caribbean with the BBC. It was inaugurated on 1 November 1976 and closed on 31 March 2005. It had a relay-exchange with the Canadian Broadcasting Corporation that allowed DW to use two 250 kW transmitters in Sackville, New Brunswick until that facility closed down in 2012. DW (TV): satellite television broadcasting mainly in German, English, Arabic and Spanish. Deutsche Welle maintains live video streams on YouTube in German, English, Spanish and Arabic, as well as several channels with recorded videos in various categories and languages. DW Akademie is Deutsche Welle's international center for media development, media consulting and journalism training. It offers training and consulting services to partners around the world. It works with broadcasters, media organizations, and universities especially in developing and transitioning countries to promote free and independent media. The work is funded mainly by the German Federal Ministry of Economic Cooperation and Development. Additional sponsors are the German Foreign Office and the European Union. DW Akademie's journalism traineeship is an 18-month program for young journalists that provides editorial training in the three areas in which Deutsche Welle produces content: radio, television and online. It is aimed at aspiring journalists from Germany as well as from regions to which Deutsche Welle broadcasts. 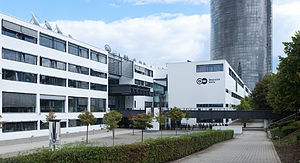 The "International Media Studies" Master's Program, offered in cooperation with the University of Bonn and the University Bonn-Rhein-Sieg of Applied Sciences, is based at DW Akademie. The four-semester program combines the disciplines of media development, media regulation, and communications. The seminars are held in English and German and the degree is aimed at media representatives from developing and transitioning countries. ^ "What kind of company is Deutsche Welle? - Questions and answers about DW as a media company - DW - 21.12.2016". www.dw.com. ^ "Who finances DW? - Questions and answers about DW as a media company - DW - 15.12.2016". DW.COM. ^ Deutsche Welle Radio - English (8 July 2014). "Deutsche Welle Radio - English - Berlin - Streema Player". Streema.com. Retrieved 14 September 2018. ^ "Deutsche Welle Act". Deutsche Welle. Retrieved 24 January 2018. ^ "Profile DW". Deutsche Welle. Retrieved 5 July 2015. ^ "Profil DW" (in German). Deutsche Welle. Retrieved 6 November 2017. ^ a b "1950–1954". Deutsche Welle. Retrieved 19 July 2015. ^ "1955–1959". Deutsche Welle. Retrieved 19 July 2015. ^ a b c "1960–1964". Deutsche Welle. Retrieved 19 July 2015. ^ a b c d e "2000–2005". Deutsche Welle. Retrieved 19 July 2015. ^ a b "1990–1994". Deutsche Welle. Retrieved 19 July 2015. ^ a b c "1995–1999". Deutsche Welle. Retrieved 19 July 2015. ^ a b "1965–1969". Deutsche Welle. Retrieved 19 July 2015. ^ "1970–1974". Deutsche Welle. Retrieved 19 July 2015. ^ "Broadcasting Democracy to Belarus". Belarus Digest. Retrieved 15 May 2015. ^ (in Russian) "Data" (PDF). www.bundestag.de. ^ "Learn German". www.dw.com. Retrieved 5 August 2017. ^ Deutsch, Warum Nicht?. Deutsche Welle. Retrieved 5 August 2017. ^ Two New Dedicated Channels Provide Gateway to Europe: Two DW-TV channel launched in Asia Deutsche Welle. ^ "No more DW-TV on Sky/Astra". Boards. Retrieved 15 May 2015. ^ "Changes in radio broadcasts starting this summer". Deutsche Welle. Retrieved 19 July 2015. ^ "Etataufstockung: Deutsche Welle erhält mehr als zehn Millionen zusätzlich". ^ (www.dw.com), Deutsche Welle. "The climate cover-up - big oil's deception | All media content | DW | 25.02.2018". DW.COM. Retrieved 26 February 2018. ^ Supran, Geoffrey; Oreskes, Naomi (2017). "Assessing ExxonMobil's climate change communications (1977–2014)". Environmental Research Letters. 12 (8): 084019. doi:10.1088/1748-9326/aa815f. ISSN 1748-9326. ^ Vivian Sequera and Andrea Shalal (April 15, 2019), German state-owned TV says it returns to Venezuela screens Reuters. ^ "Transmitting from the hilltops of Kigali". Deutsche Welle. Retrieved 19 July 2015. ^ Deutsche Welle Short Wave. ^ "Who we are". Deutsche Welle. Retrieved 15 May 2015. ^ "Traineeship Program". Deutsche Welle. Retrieved 19 July 2015. ^ "About us". Deutsche Welle. Retrieved 19 July 2015. McPhail, Thomas L. Global Communication: Theories, Stakeholders, and Trends. 2006, Blackwell Publishing. ISBN 1-4051-3427-5. Wallis, Roger, and Stanley J. Baran. The Known World of Broadcast News: International News and the Electronic Media. 1990, Routledge. ISBN 0-415-03604-6. Wood, James. History of International Broadcasting. 2000, Institution of Engineering and Technology. ISBN 0-85296-920-1. Wikimedia Commons has media related to Deutsche Welle.